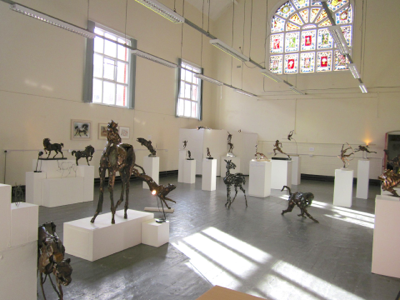 In a few short weeks since we moved into this former Victorian Art School, we have set up two large exhibitions and welcomed hundreds of visitors to the gallery. All this in a little town where there are many talented artists, but no studios or exhibition space. This is a fabulous achievement. ‘Jewel in the Town’ is one comment in our visitors book which lists the appreciation of all the people who came to see this wonderful space. We are here due to the good grace of Mid Cheshire College who own the building, and it is our intention to work with business advisers to find a way to retain this building for the arts as a legacy for future generations. The group of people behind this is ‘The London Rd Collective’, former students of the Art School who feel they were inspired by their time here and wish to continue the magic. They are prepared to do the hard work rather than stand in the spotlight - this means scrubbing floors, moving furniture, sweeping leaves as well as curating shows, managing contracts, installing exhibitions and running the business. Let’s hope we will be able to find a way to keep this Jewel in the Town for the community.